Norman Howard, right, with Michael Young, LEAD board chair. Photo courtesy of the Johnson City Press. In the 53 years since graduating from Langston high School, Norman Howard has experienced a lot. During his career, he was trained to direct fighter jets in the US Air Force to targets, managed human resources for two of Ford Motor Company’s massive automotive plants and determined how much to pay Brazilian employees during a period of hyperinflation. Mr. Howard has also served his community. From Big Brothers Big Sisters to the Boys Scouts and Junior Achievement to providing leadership for his church’s Steward Board, Mr. Howard’s service to others has been nothing short of exemplary. It’s the teachers who molded his world at Langston who deserve the credit, he says. After graduating from Langston in 1965, Mr. Howard attended East Tennessee State University for a year. Subsequently, he enlisted in the US Air Force shortly after and worked as an air traffic control and warning specialist (an air traffic controller, of sorts), identifying enemy aircraft and helping fighter jets reach their targets during the Vietnam War era. While stationed in South Carolina, he earned a bachelor’s degree at historic Benedict College, Columbia, SC. Upon graduating, Mr. Howard received seven job offers. He accepted one from Ford Motor Company and headed north to Detroit. He later earned a master’s of business administration from the University of Detroit. Mr. Howard worked for Ford for some 24 years in human resources (HR). He rose through the ranks to become human resources manager for two of Ford’s auto manufacturing plants, one with 1,800 employees, the other with 4,000. Next, Mr. Howard joined the executive team of “Greek Town Casino” in Detroit where he was vice president of human resources. There, he was responsible for a myriad of HR duties and responsibilities, including staffing, employee relations, benefit programs, salary administration, union negotiations, performance evaluations and the training of 3,000 employees. He then learned of an opportunity with the W.K. Kellogg Foundation, one of the largest grant-making foundations in the country. The philanthropic “powerhouse” established by the well-known Kellogg cereal founder, W. K. Kellogg. As human resources director for the foundation, Mr. Howard’s work took him around the world. The foundation had staff in South Africa, South America, Mexico and several other countries. Traveling to those countries and learning the specifics of Human Resource administration, compensation packages and employment laws outside the United States allowed Mr. Howard to further expand his professional skills. Regardless of where his work took him, Mr. Howard says he always relied on the foundation he received at Langston to guide his direction and leadership style. Indeed, teachers at Langston served dual roles: as educators and role models for their students. “Being a young African American male in that time period, it was a challenge to identify men in business and industry and other leadership roles (other than our parents) to emulate, so there was a great focus on our teachers,” Mr. Howard said. The teachers and administrators at Langston were not only highly educated, but they were passionate about teaching young people, he said. They also set high expectations for their students. “We had to prepare ourselves to be the very best at whatever we did. It wasn’t good enough to do a good job,” he said, adding that the high expectations carried over from the classroom to the athletic field to the larger community. Langston’s teachers’ instruction carried outside the classroom, too, he said. 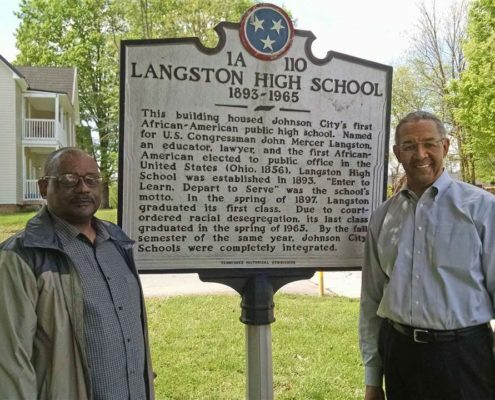 Langston served as the center of the African American community, next to our churches, in Johnson City for decades, and its influence is evident in every graduate, regardless of their career path after high school, Mr. Howard said. “Before desegregation, one thing Langston provided was a strong learning community that instilled in us an awareness of ‘self-worth,’ pride in our ability and respect for one another. This created a bond of togetherness that sill exists today,” he said. Who Doesn’t Like Pie?!? Construction is Underway!